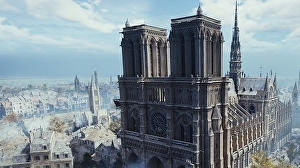 Ubisoft has announced that, following Monday’s devastating fire which caused extensive damage to Notre-Dame cathedral, it will be donating €500,000 to Paris’ reconstruction efforts. And, as an additional gesture, Assassin’s Creed Unity is currently free on PC. To that end, the publisher has pledged to donate €500,000 to help with the restoration and reconstruction of Paris’ historic landmark, and has encouraged interested fans to do the same.